And yes, it will run DOOM. Video games these days are contingent on their realistic, detailed, immersive worlds. But building that takes lots of programmers many hours; Vice City, after all, was not built in a day. What if an AI could do some of the heavy lifting (so to speak) instead? Computer scientists at Italy’s Politecnico di Milano found a way to let AI handle all the difficult parts of level design so that designers and gamers alike can get to the fun parts more quickly. 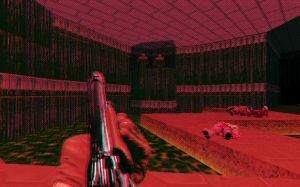 The 1993 first-person shooter DOOM was a natural place to start. People run the thing on as much technology as possible — there are people out there who will figure out how to run the game on anything with an operating system, from a thermostat to a calculator. So it made sense that the ubiquitous game should be the starting point for the scientists to train the Generative Adversarial Network that they used to create new maps. That neural net relies on two artificial intelligence algorithms working with and against each other to create believable levels. One, the generator network, received data from thousands of human-created levels, including some from the original games and some created by hobbyists. It then created new stages that looked similar. The AI took into account the overall size of the level, the heights of the walls, the number of rooms in a level, and other measurements to try and mimic man-made levels as best as it could. The second AI, called the discriminator network, is there to check its work. It, too, analyzes the original levels, but is trained to recognize whether or not they’re man-made or AI-generated. After that analysis, it takes what it learned to check the generator network’s output. With these two algorithms pushing against each other, the researchers found that their technology could generate levels that looked believable, or at least as believable as possible given DOOM’s famously-old school graphics. There were some glitches. The networks got confused about some of the fine details of how a wall ought to look, for example. But for the most part the stages were as playable as any other. But DOOM is just the beginning. The researchers believe that the general framework that runs their AI could scale up to larger and more involved games. While this could take some of the imaginative design work out of human hands, such a tool could also encourage video game developers who don’t have the budget of a major studio, allowing them to carve out their own niche in the field. With an algorithm designing or at least helping to design and construct some stages of a game, it could cost much less to make a game.